Well if you are looking for one place that have it all. There is no escape from Novotel Bangkok Platinum. 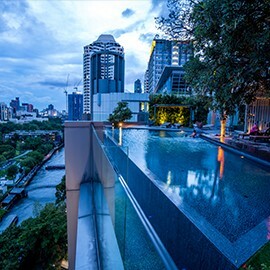 And here are 10 reasons why you must stay at Novotel Bangkok platinum. 1) Pratunam area : Pratunam is one of Bangkok’s most colourful and chaotic areas.It is a major market area with thousands of fashion stores. One of Bangkok’s highest tourist visitation area. 2) Sky walk : Easy access to everywhere you want. Stair step start right in front of the hotel door, take 2 min walk to central world, 5 min to BTS Sky train and 10 min Siam Paragon mall. It’s supper convenience to get around. 3) Above shopping mall : The hotel located right above the famous Platinum Fashion Mall. The mall is connect to hotel’s lobby. Supper convince!, so you don’t need to worry about carrying your heavy shopping bags wonder around for whole day any more. Make a quick stop to your room to drop of the stuff at any time. 4) Local street food : Thailand is the best place for street food.The hotel building is surrounded by delicious street food vendor. Once you are here , make sure to try mango sticky rice, BBQ pork and all tropical fruit juice. 5) Chicken rice : Talking about street food, the most famous Chicken rice “Go-Ang Pratunam Chicken rice”. This place is always pack, people are lining up since morning, the shop not even open by that time. The awesome thing is Novotel Bangkok Platinum is right at the opposite. 1 min walk. yes, it’s that close. 6) Heart of shopping district : Number of shopping spot in Pratunam area is countless. For shopaholic or fashion addict, this is a place for you to get high. From most luxury mall to second hand street vendor, you got it all in one area. Notting you can’t find in this area. Platinum fashion mall, Central world, Shibuya, Siam Paragon, Big-C, Grayson plaza and the list go on forever. 7) Erawan Shine: 4 mins walk from the Hotel, you will find Erawan Shine. Thai representation of the Hindu god of creation, statue of Phra Phrom. A popular worship attraction. You can see local Thais making merit to the statue with incense, candles, flower and see a troupe of Thai classical dancers in costume. 8) local boat adventure at Saen Saep Canal: The most widely used public transportation is canal boats at Khlong San Saeb. Catching the San Saeb boats can be a little harrowing, but that is when the fun begin. Prepare yourself to climb over the outer edge as people quickly jump on and off. But this canal boat will take you everywhere through out Bangkok. 9) Amazing roof top bar: BAR9 Beer Garden Bangkok, is one of the hippest spots in Bangkok for those in the know. 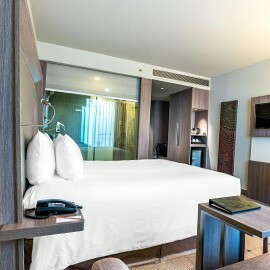 A local hidden secret on the 9th Floor of Novotel Bangkok Platinum Pratunam. Discover Bangkok’s Best Rooftop Beer Garden during sunset and enjoy views of Bangkok’s city skyline and spend time with friends at the most comfortable spot! 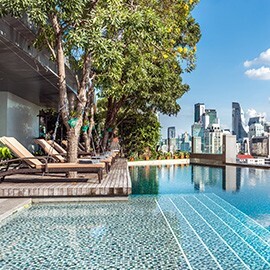 10) Infinity pool with the sky view: Swim a few laps in the outdoor Swimming Pool or sunbathing options with stunning city views of the heart of Bangkok. With your sun glasses on and a glass of cocktail in your hand. Nothing can beat that.